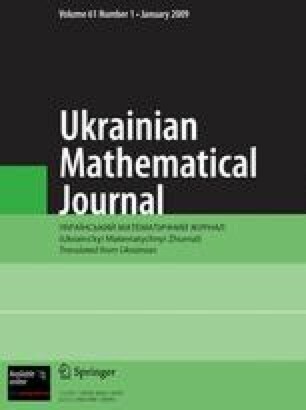 We find asymptotic formulas for the least upper bounds of the deviations of Fourier operators on classes of functions locally summable on the entire real axis and defined by <InlineEquation ID=”IE2”><EquationSource Format=”MATHTYPE”><! [CDATA[% MathType!MTEF!2!1!+-% feaafiart1ev1aaatCvAUfeBSjuyZL2yd9gzLbvyNv2CaerbuLwBLn% hiov2DGi1BTfMBaeXafv3ySLgzGmvETj2BSbqefm0B1jxALjhiov2D% aebbnrfifHhDYfgasaacH8srps0lbbf9q8WrFfeuY-Hhbbf9v8qqaq% Fr0xc9pk0xbba9q8WqFfea0-yr0RYxir-Jbba9q8aq0-yq-He9q8qq% Q8frFve9Fve9Ff0dmeaabaqaciGacaGaaeqabaWaaeaaeaaakeaaru% WvHjNBVn2AGaLCVbctPDgA0bYu1jgALfgzaGqbaiqa-H6agaqeaaaa% !42E4! ]]></EquationSource><EquationSource Format=”TEX”><! [CDATA[$$\bar \Psi $$]]></EquationSource></InlineEquation>-integrals. On these classes, we also obtain asymptotic equalities for the upper bounds of functionals that characterize the simultaneous approximation of several functions. Translated from Ukrains’kyi Matematychnyi Zhurnal, Vol. 56, No. 7, pp. 960–965, July, 2004.